Colgate® is excited to introduce the Next Generation of Colgate Total®. 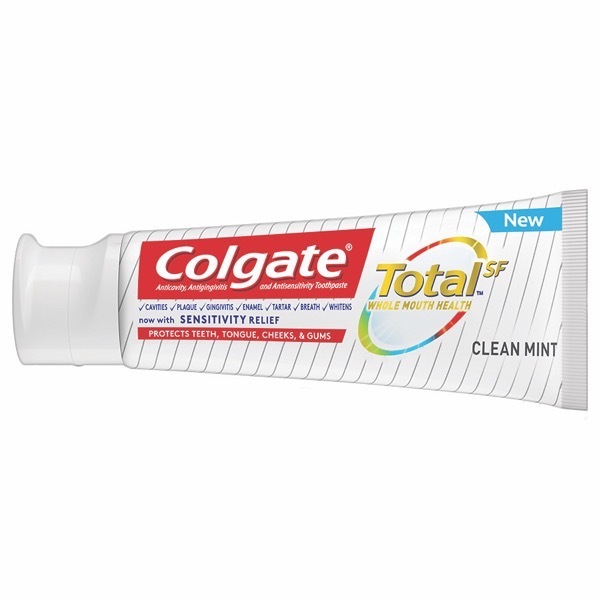 New Colgate Total®SF contains a new Stannous Fluoride formula stabilized with Zinc Phosphate that fights plaque-causing bacteria on 100% of mouth surfaces*1 including teeth, tongue, cheeks, and gums, providing the ideal preventive solution for whole mouth health. Colgate Total®SF effectively fights harmful bacteria while protecting against bacterial repopulation, significantly reducing the overall bacterial load while creating a protective barrier that helps shield against attachment and regrowth. In development for more than a decade, the unique formula of new Colgate Total®SF is the subject of 28 granted patents and 95 pending patent applications. Offering comprehensive benefits for the whole mouth, the new advanced formula found in new Colgate Total®SF addresses all indications of the original Colgate Total® including plaque, gingivitis, caries, stain removal/whitening, and calculus. Yet new Colgate Total®SF delivers even more benefits than ever before to help patients achieve superior whole mouth health. *Statistically significant greater reduction of cultivable bacteria in saliva and on tongue, teeth, cheeks, and gums with new Colgate TotalSF vs non-antibacterial fluoride toothpaste after 8 weeks, 12 hours after brushing.